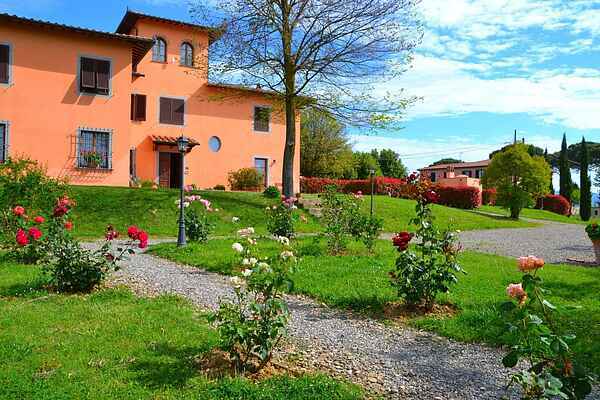 This is a beautiful Farmhouse in the Tuscan countryside. surrounded by olive trees and vineyards, just 1km away from Stabbia center. It is a strategic point from where you can go on many trips as the area is very rich in things to see and do (from welfare to culture, entertainment) Nearby is Cerreto Guidi where you can visit the prestigious Villa Mediacea of ​​1500 and the picturesque town of Vinci, birthplace of Leonardo. With about half an hour drive you can easily reach the main Tuscan cities like Florence, Pisa, Lucca, Pistoia, Certaldo and at about 70 km Siena and San Gimignano. A few kilometers away is Monsummano Terme with the Grotta Giusti where you can relax a day at the spa. For the little ones it will be a fantastic experience to visit the park dedicated to Pinocchio which is located in Collodi (ca. 25 km away). We also recommend you to see the Ceramics Museum in Montelupo where you can learn how the famous local ceramics are made. We also recommend many local restaurants and in the summer some "festivals" where tyou can taste the typical products of various locations such as San Miniato Truffle festival, very famous festival for the truffle connoisseurs. There are various seasons that are great in this region, not only during the summer, such as during the months of spring as the weather is always very good and the great cities of art that are nearby are not so crowded with tourists.